Theresa May's leaked "secret Brexit deal" as announced in today's Sunday Times aims to keep the whole of the United Kingdom in the customs union indefinitely. Side note: We shouldn't just assume that everyone who is a member of the Tory party is a unionist. Let's not forget that the majority of Tory party members recently said that they'd rather lose Scotland than remain in the European Union. Originally, the EU had insisted on Mrs May agreeing to the Irish backstop - a deal which effectively puts a customs border on the Irish sea, which some within the Tory party argued would compromise the "integrity of the United Kingdom." It would now appear that the UK will be remaining in the customs union altogether, which Theresa May would have us believe, now means that there will be no need for a border between the occupied north of Ireland and the Republic of Ireland. Once Scotland declares independence, the EU will almost certainly agree to allowing Scotland to remain in the customs union until a future EU relationship is decided, which will mean that both Scotland and England would be in the customs union. In 2014, during the first Scottish independence campaign, the unionists had argued that there would need to be a border between Scotland and England, as Scotland would no longer be members of the European Union immediately after independence. The unionists told the Scots that the only way to secure EU membership was to vote no in 2014. However, the opposite was true, because in spite of 62% of Scots voting to remain within the EU at the 2016 EU referendum, the English leave vote ensured Scotland's departure. 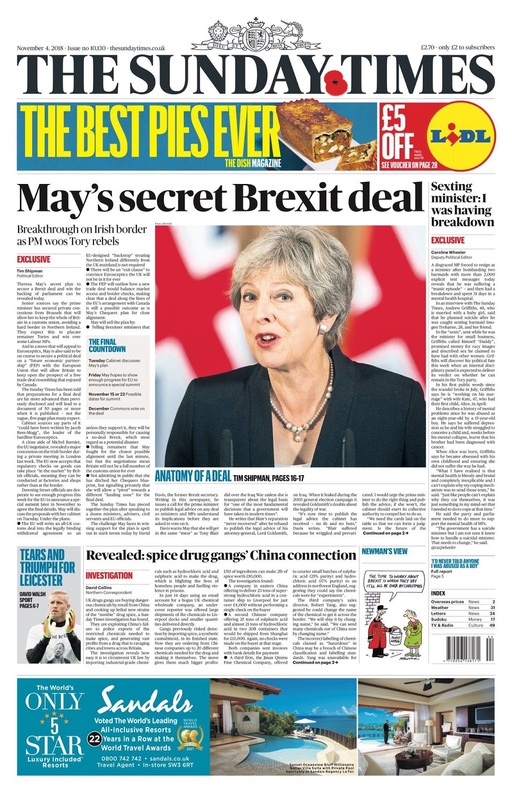 If Mrs May goes ahead with her "secret deal" and she insists that this means there is no need for a border in Ireland, then it certainly also means the same for Scotland in the immediate aftermath of an independence vote. If the Brexit negotiations have taught us anything, it's that in order to get their Brexit deal, the British establishment would bend over backwards to ensure that there is no border in Ireland, which highlights to the Scots the hypocrisy, given the patronising manner in which they were addressed in 2014. The British establishment treated the Scots with utter contempt in 2014, telling the nation "if you vote yes, you can't have the pound, if you vote yes we'll throw up a hard border" etc. One would have to wonder whether or not Theresa May has secretly already conceded defeat over Scotland. Surely by now, she must have realised that the Scottish independence movement is a runaway train that will not be stopped?